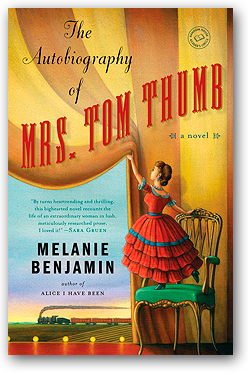 The questions and discussion topics that follow are intended to enhance your reading of Melanie Benjamin's The Autobiography of Mrs. Tom Thumb. What are the parallels between Vinnie's celebrity and the definition of celebrity today? Why did Vinnie determine to only communicate her optimism—what was she trying to hide behind, or hide from herself, by choosing not to dwell on the many obstacles in her way? Why did Vinnie go along with Barnum's humbug concerning the infant? Which is the true love story of the book—the story of Vinnie and Barnum, Vinnie and Charles, Vinnie and Minnie, or Vinnie and the public? Why do you think the notion of the Tom Thumb wedding so swept the nation that, even today, there are reenactments with children? What was the most interesting historical fact in the book for you? Which was the most startling? Sylvia points out a photograph in the window of a store. It's of PT Barnum. "Really?" I was surprised and, I confess, a little disappointed; the man in the photograph looked so very...ordinary. Curly hair parted on the side, a wide forehead, a somewhat bulbous nose, an unremarkable smile. He resembled any man I might have passed in the street; he certainly did not resemble a world-famous impresario. Colonel Wood, I had to admit, looked much more the part than did this man (p. 78). Vinnie is used to people making immediate assumptions about her based on her appearance. What assumptions, though, does Vinnie make about people for the same reasons? Are pre-conceived notions about people something that is ingrained in us? What do you think it means to live one's life in the public eye, as Vinnie and Charles did? How would you react to being scrutinized by the press for your every action? Compare how you may have felt in Vinnie's day compared to today's twenty-four hour news and gossip cycle. For Vinnie, what do you think was the best part of being famous? What was the worst? Toward the end of her stage career, Vinnie asks herself, "had I ever been simply Lavinia Warren Stratton? To anyone—even myself?" (p. 363) Do you think Vinnie chose this life for herself, or did she essentially hop on a ride and couldn't get off? Was the price she had to pay for her fame and fortune her own chosen identity?